The humidity test chamber used in the experiments. 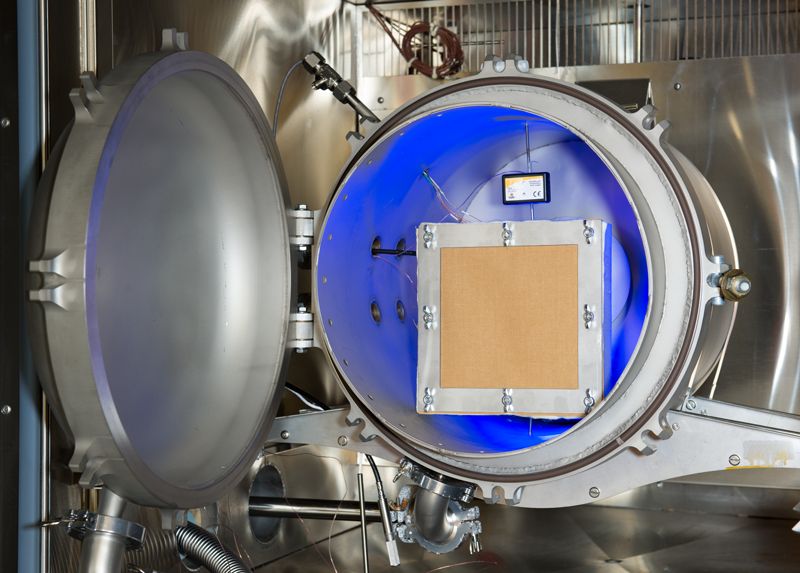 Fabric swatches are bolted to a sample box which houses a humidity and temperature sensor, and that ensemble is placed inside the cylindrical innermost section of the test chamber pictured above. Another sensor (black rectangle, center) records the temperature and humidity levels outside the sample box. A mystery has raged for decades surrounding accounts of firefighters who receive steam burns through their protective clothing. One ruling theory is that the heat of the flames raises firefighters' own perspiration to the scalding point. A series of exploratory experiments being conducted at NIST are investigating a second potential culprit: water vapor that quickly penetrates their protective suits and then condenses on their skin. If vapor penetration turns out to be a significant cause, the researchers hope their study could lead to new protocols to help firefighters decide how much time they can spend in a given environment before they risk getting steam burns. Future work could also inspire new design ideas for firefighters' protective clothing (FFPC). FFPC suits consist of three key layers of fabric: an outer shell made of a tough, light material, which serves as a first defense against flames; a middle layer that repels liquids on one side but allows perspiration to evaporate; and, closest to the skin, a quilted thermal liner for insulation. But the suit's breathability is a two-way street, meaning vapor – water in its gaseous form – can enter. And burning buildings can actually be fairly damp environments, not only because firefighters are spraying water onto a blaze but also because water vapor is produced as part of the combustion process, a chemical reaction that turns four hydrogens and two oxygens into two molecules of H2O. * More water vapor in the air means a greater chance that it will find its way into relatively dry places such as clothing. Fabric sample box sitting inside the chamber. It has been unclear what role this vapor penetration plays in causing steam burns. In the current study, being conducted by a collaboration between the Physical Measurement Laboratory's Thermodynamic Metrology group and the Fire Research Division, NIST researchers are determining how quickly the vapor can penetrate the protective fabrics, to see whether this issue should continue to be investigated. Using a metal humidity chamber about the size of a kitchen oven, NIST researchers expose the three-layer FFPC fabric swatches to temperatures between 30 and 80 degrees Celsius (C) and relative humidity levels between 50% and 90%, a range of conditions that could be experienced by firefighters. To make their measurements, they place a sensor inside a thick insulated box (see photo at left) and then bolt the material samples over its opening. This sample box is placed inside the humidity test chamber. In the potential steam burn mechanism they are exploring, water vapor accumulates in a burning room, penetrates the firefighters' protective clothing, and collects in the layer of air between clothing and skin. Water vapor from human perspiration also increases the humidity in this air layer. For an air pocket at a given temperature, there is a threshold moisture content, called the dew point**, at which the air pocket can no longer absorb moisture. Once this threshold is reached, moisture entering the pocket begins condensing into liquid droplets on the skin. The transition from vapor to liquid releases heat and raises the temperature of the skin, the opposite of the process that makes swimmers shiver when they emerge from a pool. Irreversible skin damage can occur within minutes at about 48 degrees C. The theory is that when the moisture level in the air layer between the FFPC and the skin gets high enough, steam burns might become possible. 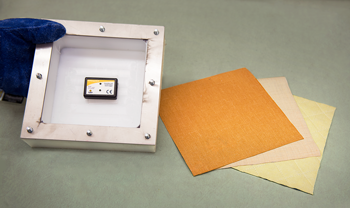 Sample Box Deconstructed: Inside the sample box is a sensor (black) that records temperature and humidity levels. The box's opening is covered by swatches of the three fabrics that make up a firefighter's protective suit: a tough outer layer (top), a one-way-waterproof middle layer (middle), and a thermal liner for insulation (bottom). More work is needed to determine vapor penetration's role, if any, in a real firefighting environment, the researchers say. However, so far the team has found that when the box is protected by a layer of some non-permeable substance like aluminum foil, essentially no vapor reaches the sensor inside: in one test, the humidity inside the box changed hardly at all even after 2 hours when exposed to a temperature of 60 degrees C and a relative humidity of 75%. But when they cover the test box with the FFPC fabrics and expose it to the same temperature and relative humidity levels, the researchers detect, within minutes, water vapor that has reached the dew point. Over the next few weeks, the team will continue making measurements with various fabrics at different combinations of temperature and humidity levels. Their goal is to determine a humidity-penetration time constant – a value that indicates how rapidly humidity levels are changing – for each fabric as a function of temperature. * As an example, if the methane (CH4) in natural gas is the fuel, the chemical reaction for combustion is CH4 + 2O2 ➞ heat + CO2 + 2H2O. ** This is the same process that creates dew overnight, when humid air cools until it can no longer hold as much vapor.